Control weeds early. 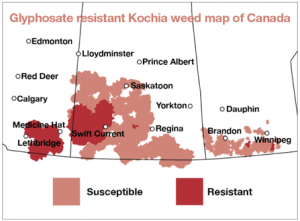 Herbicides are more effective on small weeds. Rotate with crops that allow for a wide range of herbicide groups, and that have different seeding and harvest timing (winter cereals, for example). Use tank mixes. Hitting weeds with two modes of action effective on each weed reduces the risk of herbicide resistant weeds escaping and setting seed. Use the right herbicide at the right rate and apply at the right time. Cutting rates, for example, may reduce herbicide efficacy and increase weed seed return to the soil seed bank. Control weeds throughout the season to reduce the weed seed bank. This map is from BASF. Source location.